All rhodopsins, whether responsible for the visual process (visual pigments-Rh), photosynthetic activity (bacteriorhodopsin-bR and halorhodopsin), phototaxis (sensory rhodopsin-sR), or photoisomerization (Retinochrome), share the same basic chromophore system: a retinyl polyene, bound to the opsin via a protonated Schiff base linkage with a lysine e- amino group . Moreover, most rhodopsins (e.g., Rh, bR and sR) exhibit photocycles with remarkably similar features . Primarily (see Fig. 1) The occurrence of an early red shifted photointermediate, the deprotonation of the Schiff base during subsequent stages, the photoreversibility of most intermediates, the time scales associated with various stages of the photocycle, etc. It is the purpose of this overview to discuss in a comparative way the primary photochemical steps in Rh and bR, as monitored by optical, resonance-Raman, FTIR and NMR spectroscopy. 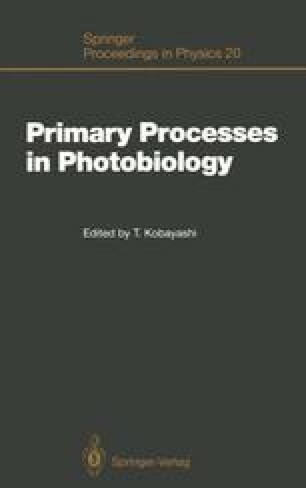 Interpretation of such phenomena in terms of the primary molecular changes occurring in the retinal moiety and its protein environment is an essential pre-requisite for understanding the mechanism by which retinoid pigments convert, store and subsequently utilize, solar radiation. Such topics will be addressed in light of recent progress and still open questions.